Mammals It is very likely that there are mammals using your garden, in your local park, on your allotment or even around the place where you work, but you are not often likely to see them. Many of our native mammals are either nocturnal or very shy, but it is possible to find signs that they are around. 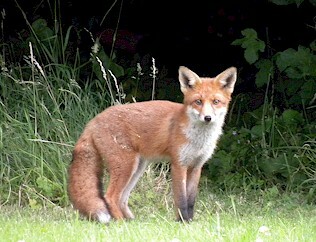 Foxes in particular have become more common in our towns and villages. They are intelligent animals able to make use of the resources they find in built up areas, including dustbins, where they will forage for food. It is estimated that around 15% of the entire British fox population now live in urban areas. If you think you may have hedgehogs, badgers or foxes in your garden, you might find their droppings or ‘scats’ which may be deposited in strategic places. Fox droppings are often left in the same place every night, as they are used to mark the territory of an individual animal and you may see them on a mound of grass, a log or anthill. Fox droppings often contain hair, fur or feathers from mice or birds, although a large part of a fox's diet is made up of earthworms, beetle and moth larvae and even fruit such as blackberries although in urban areas foxes will feed on discarded food from bins. In gardens foxes will often have a daytime resting place above ground, possibly on top of a shed especially if it is covered with climbing plants. They only use a den below ground in bad weather or if the vixen has cubs. To find out if you have foxes in your area, look out for their droppings described above, which have a characteristic strong, foxy smell, or check your garden for small, oval dog-like tracks after a fall of snow. Hedgehogs are small mammals that everyone likes to have around, because many invertebrates that we regard as garden pests are their main source of food. Roughly sixty percent of a hedgehog’s diet is made up of beetles and caterpillars. Another ten percent is earthworms, and slugs only five or six percent, but hedgehogs are still very useful predators of these garden pests. Snails are rarely eaten, probably because the shell is too hard. In the garden hedgehogs will eat a wide variety of food, and you can encourage them to visit your area nightly by providing them with dog food or specific hedgehog food which is now available. This should always be accompanied by fresh drinking water. Bread and milk should never be given to hedgehogs as it can cause stomach upsets that can lead to dehydration, especially in youngsters. If young hedgehogs appear in your garden late in the summer, they will need extra food to enable them to reach a weight of 450 grams (if they are smaller than this they will not survive hibernation), so continue to feed them as long as you can. Hedgehog droppings, which are black and shiny and may be up to 4 centimetres in length, are often found in gardens. It is usually possible to see small fragments of the wings of beetles in these droppings. Through spring, summer and autumn hedgehogs need undisturbed places to make their daytime nests of grass and other vegetation. In the winter a hibernation nest, generally made of leaves, will be built beneath a hedge, in a tangle of brambles or under a pile of logs. Try not to disturb log piles or anywhere else you think there may be a hedgehog. You can provide a hedgehog box if you wish, in a secluded place in the garden or allotment. Badgers sometimes visit gardens to find food if their sett is nearby, and many people love to watch them. Like foxes they have a very varied diet and eat a great number of earthworms. This sometimes causes conflict with gardeners as badgers will dig in a lawn for the earthworms beneath the surface. If this is a problem, a lawn that is not watered in dry spells will attract less unwanted attention from badgers. As with other mammals, badger droppings are a sign that they may use your garden or allotment area. These are deposited in small pits or 'latrines' that the badgers dig on the edges of their territory. Badgers can be encouraged to visit your garden if you supply food for them. They enjoy a varied diet and are fond of kitchen scraps, fruit and peanuts. Bats have declined dramatically in the UK in recent years. There are 16 species in total in Britain, but only four of these are common in gardens and built up areas. The most likely species that you will see around your garden at dusk are the two species of pipistrelle, our smallest species with a wing span of only 20 centimetres. They are usually the first bats to emerge at dusk and you may notice their quick, slightly fluttery flight as they take the same route around your garden four or five times. One reason for the decline of bats is loss of suitable roosting sites. In the summer months they require a warm daytime roost especially if they are breeding. Buildings are a favourite place as long as there is access to a small sheltered space in a porch, a shed or under the eaves of the house, and you may find their tiny black droppings beneath roosting places. Unlike mouse droppings, these will crumble to a fine powder when rubbed. If bats do roost in your loft, remember that they are protected by the Wildlife and Countryside Act of 1981 and should not be disturbed without permission. To encourage bats you can put up a bat box on a sunny, south facing wall. Boxes made of ‘woodcrete’ or special ‘bat bricks’ are preferred to wooden ones as they are better insulated. Winter hibernation roosts are more likely to be in the countryside in hollow trees or old railway tunnels. There are many other small mammals that may visit even the tiniest garden, and you might catch a glimpse of a shrew, vole, mouse, mole or weasel. If you live in the north of the country you may be lucky enough to see red squirrels or even pine martens. Rabbits, muntjac deer and grey squirrels may all visit our gardens and these mammals can be destructive, but many people still enjoy seeing them. The antics of grey squirrels can be fun to watch, but they can destroy bird feeders and damage trees. If grey squirrels visit your garden frequently, squirrel-proof bird feeders are an effective way of preventing them from eating all your bird food! There are three important things you can do to ensure the mammals around you visit your garden. Firstly, an undisturbed area will provide shelter for finding food and possibly breeding. Secondly, growing a wide range of insect attracting plants will benefit almost all mammals – even badgers and foxes eat their share of these and bats, shrews and hedgehogs will certainly benefit. Lastly, a pond or drinking place with easy access may provide you with opportunity to watch some of our native mammals in your own garden. Amphibians Frogs, toads and newts use our ponds for breeding in springtime but spend much of the rest of the year in the surrounding habitat – hence the importance of getting that right when your pond is constructed. Spawning of frogs can start as early as January in the south, toads spawn a little later, usually in March or April and newts latest of all (April or May) but the breeding of all these amphibians is dependent on temperatures and weather conditions. The common frog is the most likely amphibians to use a garden pond for breeding – indeed there are thought to be more common frogs in suburban areas now than in the countryside. They are not particularly fussy about the type of pond they use, and generally lay their jelly-like blobs of spawn in the relatively warm and shallow water close to the pond edge. Common Toads lay their spawn in long strings like transparent necklaces with the black eggs visible along the length, and they wind the spawn around aquatic plants. In general toads prefer a pond with a good deep area of cool water and sometimes frogs and toads won’t co-habitat in the same pond. The common newt, also known as the smooth newt, will find its way into even the smallest pond. They lay their eggs singly and attach each one to the undersides of the aquatic plant leaves in a pond, especially the oxygenators. The eggs are tiny and usually very difficult to see. Great crested newts will also use a garden pond, but this declining amphibian does not have a regular distribution in Britain and is a protected species. Great crested newts are almost black and quite large – they can reach up to 18 centimeters in length - so they can be distinguished by size and colour from common newts which are usually a muddy brown. Great crested newts are fully protected by law under the Wildlife and Countryside Act 1981 and their habitat should not be disturbed in any way. If they are locally common in your area they will happily co-habit with other newt species, but it is worth remembering that they will eat the spawn and small tadpoles of rrogs which may deplete your population of these amphibians. If amphibians of any species are around in your area they will soon find a new pond and make it their home. Importing frogspawn from other ponds is an easy way to spread disease and best avoided. If you are fortunate you may find that slow worms and grass snakes use your garden. Both of these animals are attracted to undisturbed habitats especially compost heaps in gardens, where temperatures are often warm. Grass snakes also like water so a wildlife pond, especially if it has a good frog population, will also attract grass snakes. Slow worms also prefer to inhabit undisturbed areas of garden where perhaps there are piles of stones or rubble, with overgrown vegetation or in log piles. Adders and smooth snakes are rarely found in gardens. Similarly, lizards are quite uncommon in gardens unless you happen to live in an area where they are abundant. If you have any of these reptiles in your garden, you should be aware that they have some level of protection under the Wildlife and Countryside Act of 1981.